While I know that this isn’t my normal post, it is one that I want to do today for the specific purpose of wishing my wonderful wife a happy, happy birthday. I was hoping to be home from my trip today and not still slogging on towards Katahdin, so this shouldn’t be necessary. However, I have been unable to keep up with my original schedule and am currently in the 100 Mile Wilderness with no access to wifi, so this is written in advance. Diane has been my rock during the trip and I know that I wouldn’t have been able to even attempt it without her unconditional support. So, honey, you should know that I love you more than I could ever adequately tell you and I hope to be able to show that every day on my return. Your selflessness has always been an inspiration to me and I’m looking forward to seeing you and restarting our life together. We spent our third and last night at the Farmhouse and had another early morning, very cold, journey back to the trail. I really enjoyed our stay there and think they have a great place that will only get better over time. Stacey and Shane make you feel so welcome and Shane is sure to end up as mayor; he is a great bloke and knows everybody. We were driven back via the Stratton Motel and dropped our excess baggage at the motel before heading back to the trail where we had left off the day before. On the way, we took a road known locally as Moose Alley, due to the frequent altercations that take place between moose and car. As some moose can get to 1200 lbs, these meetings can go either way. Seeing a moose on the trail, as we had done previously, is quite a big deal, yet seeing one even on the road is a sight to behold. Suddenly, ahead of us, two magnificent beasts emerged from the woods and bolted straight across the road, one male, one female. Luckily, the car ahead managed to avoid them easily and we had a few seconds to watch open-mouthed as they lunged back into the forest. This stuff just doesn’t get old. As usual, we started with a hefty climb, up from Caribou Valley Road, to South and North Crocker Mountains. This required a 2000 ft climb, some of which was over very exposed rocks in high winds and was a little perilous from time to time. However, once over the two peaks, there was a very comfortable downhill all the way back to the main road and a hitch into Stratton. We were lucky enough to run into a couple of previous thru-hikers who happily drove us all to the motel. Getting into a car and NOT seeing the driver reach for the window control as the odor hits him squarely in the face is a pleasant change. I shot a pretty cool video that showed the effect of high winds on trees, with an alarming view of the way that the roots were being disturbed. Lighterknot, Karate Kid and I quickly headed to the inn adjacent to the motel and filled up with more carbs before I crashed out on my bunk for a couple of hours. Wonderful. The following day, with yet another slackpack “opportunity,” as Tee Bird refers to them, I had one of my best days on the trail. We were heading over The Bigelows, a nearly 17 mile day with 3 peaks over 3500 ft to cross and I enjoyed every second. The sun was out and, while it was chilly, our exertions allowed us to remain warm all day. A little further on, with the wind now getting up, I shot another gorgeous 360 of these beautiful mountains. The owner of the Stratton Motel, Sue, met us at East Flagstaff Road and we returned to the motel in perfect time for another Wolf Burger at the Wolf Inn. With so many calories burned during the day, this one hardly touched the sides on the way down. By contrast to the day before, the following morning opened dark and brooding with rain expected and, ultimately, falling. We were back to our full packs and, even though it took a while to readjust to our normal burden, we all managed well and were able to put in another 16+ mile day. The terrain wasn’t as spectacular as the day before, with far less climbs and, generally less exhausting hills. We had been in motels/hostels for a while and I remarked how nice it was to be back in the woods. We were camped at Pierce Pond Lean-to, all managing to get decent tent sites, notwithstanding the protruding roots all over the ground that are also proving to be problematic on the trail. When these roots get wet, from rain or even just overnight dew, they can be lethal. The next day we had planned a relatively low mileage day, having camped just 3.7 miles short of the Kennebec River. This river is about 100 yards wide and the ATC provide a ferryman who paddles hikers across 2 at a time. We got there on yet another delicious day and only had to wait a few minutes for him to return. He is very knowledgeable and proceeded to tell us about the river and the ferry, clearly proud of his part in all of our epic journeys. It was a gorgeous morning that cried out for a video as we waited in the warm, quiet air. Once across, we took our planned detour into Caratunk and the Post Office, where Tee Bird was picking up a restock package from her husband. Trillium had a package delivered by her partner to a local hotel, so we calked for a shuttle and were quickly picked up and whisked to a very pretty hotel, where we were able to restock (more Snickers and Peanut Butter for me). Unfortunately, the hotel wasn’t able to provide much food, other than frozen pizza and burgers, so the owner kindly took us to a local brewery and pub. This was one of those build your own burger places and, despite a basic price of about $8, I ended up with a massive $20 superburger, which included lettuce, tomato, onion, mayo, cheese, bacon and a fried egg, as well as another half pound patty. Karate Kid did the same. However, I followed mine by demolishing a huge brownie with cream and ice cream and washed it all down with two beers. I may be looking like a starving refugee right now, but I’m not going down without a fight!! We persuaded the guy who ran the 12.00pm shuttle to delay it for “a few minutes,” eventually leaving for the trailhead at 1.15. Amazingly, as we waddled up the trail, I ran into Bassman, the guy I hiked with many hundred miles before who had later helped me run around to get some errands done in CT. I didn’t have time to chat, as the team had already moved ahead, but it was great to see him, as he was about to start a section hike further south. We hiked another 6 miles to get to the Pleasant Pond Lean-to and set up a little back in the woods, though one of the youngsters at the shelter bravely dived into the water to cool off. I guess we were all young and immortal once. Leaving Pleasant Pond the following morning, we had a steady hike up Pleasant Pond Mtn, after which we were treated to a gentle descent over several miles that eventually moved back uphill over Moxie Bald Mtn, leading us ultimately to Moxie Bald Lean-to. It seems that, when naming their shelters, Maine lost all originality and simply named them after the nearest topographical feature. This latter site was absolutely spectacular, as we were all able to tent close to, and in sight of, the magnificent pond. The night was cold and I heard once more the haunting, plaintive cries of loons on and around the pond. This is such a distinctive call and is an unexpected (to me) bonus of Maine. When I woke the next day, the sun was still below the horizon, so I set up my breakfast on the rocks right next to the water and was rewarded as the sun leapt dramatically and spectacularly into the new day. It was silent, with a beaver messing about in the water less than 20 ft from me. The others joined me and we soaked up the sun, somewhat reluctant to get on out way. Our plan for Friday and Saturday was to complete the 18 mile journey into Morson, probably stealth camping about 4 miles short of Monson, completing the trip early Saturday morning. The hike, for the most part, was unremarkable, in that there were no mountains to scale and it was a generally gentle true walk in the woods, with just rocks and those darn roots to watch out for. However, what made this day memorable was the fact that there were 2, fairly wide rivers to ford that required all of our attention. The first was the most fun, as the only way to do it was to wade across, removing boots and socks and rolling up our pant legs. With the water in Maine now devastatingly cold, this certainly had its moments. Fortunately, nobody fell in and the second crossing was completed with boots on, incorporating rock hopping and eventually balancing on a fallen tree. Great stuff. We didn’t need to stealth camp that night, as a new hostel/camp had opened only 3 miles from Monson, so we gave it a shot. A former thru hiker, Phil, has built a terrific little camp, with private and semi private cabins as well as flat tentsites in an area he has cut out in the woods. We went for the tentsites and he even lent us his truck to go for dinner into Monson. I predict that, if managed well, Phil’s place will prove to be a big hit with hikers next year. With less than 4 miles to go on Saturday, we quickly got to the road where we were picked up by a shuttle from Shaw’s, Monson’s main hostel. Another artery-clogging breakfast at Pete’s Place was despatched and the day was spent showering and clothes washing for the upcoming 100 Mile Wilderness. The owner of Pete’s Place even lent me her car to visit an outfitters 15 miles away to buy a groundsheet for my tent, as small holes have appeared in the tent floor and I was rather keen to avoid dampness in the tent in these last days. The generosity of complete strangers remains a wonder to me. Along with an increasing number of fellow hikers, we will be doing the first 3 or 4 days in the wilderness with lighter packs and coming back to Shaw’s each night before pushing on to the end and summiting Katahdin on Monday 29th. I’ll sadly be missing Diane’s birthday, but we are both now so excited to be on the last leg of this epic journey. I’ve really appreciated all the comments people have made on my blog and can assure you all that the encouragement that has given me has been immense. Thanks to everybody who has taken the time to write and to those of you who have joined the Last 2000 Mile Challenge; it’s still not too late!! It’s been a while since I was able to post and I’m now appreciating quite how remote Maine, indeed New Hampshire as well, can be. We left the White Mountain Lodge and Hostel after a big breakfast and some regrets, as it was another one of those gems on the trail that always take you by surprise. With the Whites behind us, we took some relief from the gentler incline at the start of the day, though gentler is merely a relative term and not to be interpreted as gentle in any way, as we were all sweating profusely within minutes. This was partly due to the incline and partly due to the warmth and humidity of the day. Of course, the higher we got, the cooler it became, so it was a terrific start and we covered over 6 miles before stopping for lunch. We had all over-shopped at Walmart the previous evening and went about reducing our increased load by consuming as much as possible. I seem to have developed a somewhat unhealthy fixation for Snickers and Peanut Butter and will need to curb this rather disturbing habit in the near future if I’m not going to end up back at 250lbs by the end of the year. Given our new group of 4, we’ve had to adjust the length of our potential mileage and had to settle for Gentian Pond Shelter, at just over 11 miles. We put up our tents on tenting platforms, which are wooden slats set level with the ground, thus obviating the need to find a flat spot on the ground. Very helpful to somebody like me, as I remain incapable, even after all this time, to find any level ground at all, often to be found in the morning tangled up with my pack in the bottom corner of the tent. We left Gentian Pond just after 7am with 2 targets imminent. The first, the 1900 mile marker, was upon us within the first hour, yet the second was probably most significant as we moved into Maine, our 14th and last State. For months, I’ve refused to think too much about Katahdin, as it was so remote and in the future, yet here we are, in Maine. So I’ve allowed myself the luxury of imagining my picture at that iconic sign. It feels good to allow myself to add some reality to the fantasy. I also notched up another fall, this one being the 36th time, catching my bent knee under my body. I’d been feeling particularly sore in my left knee just before I slipped and, rather amazingly, the knee felt relieved after, as if the fall had stretched whatever was ailing me. I’m aware that my falls are increasing with the difficulties we have encountered in New England and I’m really trying to be careful and avoid a bad fall that might jeopardize my hike. Trillium had arranged for one if her partner’s relations, Geoff, to meet us at the end of a 2.5 mile side trail and take us back to his cabin in the woods. He was going to slackpack us through the Mahoosuc Notch the following day, which meant that we had the luxury of only taking a daypack and returning to his cabin that same evening. Geoff has a rather chaotic, though cosy, home and he made us all feel very welcome, with Lighterknot and I on the floor while Trillium and Tee Bird took the sofas. While he doesn’t hike himself, he knew that hikers are generally ravenous, so went out to get some food at a local restaurant, returning with both a burger AND a meatloaf meal for Lighterknot and me. The following morning, as Geoff drove us back to the side trail that would lead us back to the AT, clouds had formed over the mountains that looked like a comforter thrown over them. This augured well for the rest of the day, as there was a glorious blue sky everywhere else and we knew that the sun was steadily burning the comforter away. The Mahoosuc Notch is a collection of huge rocks, making up a puzzle for hikers that is about a mile long. There are choices to be made as to whether to go over, go round, or even go under rocks as we threaded our way through this mile of mayhem. It was a lot of fun but took us nearly 3 hours as a team. Once we had negotiated that, there was an extensive climb up Mahoosuc Arm, so that, by lunchtime, we had only done just over 2 miles of the trail. The sun had done its job and we were rewarded for our hard work, as so often in New England, by a glorious view at the top. As the afternoon progressed, I fell twice more, for my 37th and 38th tumbles. The second was fairly uneventful and didn’t hurt too much, though the first was one of my worst falls. I was pulling myself up a very steep, sheer rock face and had just left the comfort of a tree root that I’d been pulling myself up with to get to another one, when I felt my boots slip slightly on the rock. I thought I’d steadied myself and made the fatal error of relaxing for an instant, only to take off, like a giraffe wearing socks, sliding down, then falling about 15 to 20 feet, badly banging my hip as I fell. I always shout out the number of the fall as soon as I realize that I’m not bleeding and nothing is broken, yet this call was accompanied by a grimace as I felt the pain. There never seems much point in hanging around in these circumstances, so I got up and got on with it as usual. Happily, everything worked as before, though the hip hurt like blazes every other step. The climb down after a few more gorgeous ups was 3.5 miles and seemingly endless. Eventually, we met Geoff just before 7pm and he took us for an excellent Chinese meal. Geoff had to drop us off early at Grafton Notch the following morning, as he needed to get to work, so we loaded our surplus stuff into bags and left them to be collected by the folks at The Cabin, our next stay, in Andover. Once more, with lighter packs, the hiking was easier and we made our way up the glorious Baldpate Mtns, East and West. This part of the trail took us above tree line, which I love, so the resulting video is pretty darn nice. As you can tell, slackpacking had become something we were getting used to and we became aware that the majority of our fellow hikers were doing the same thing. By now, Tee Bird had emerged as our booking agent and she had arranged for us to be met by Earl, or Bear, the proprietor of the Cabin. Bear and his wife, Honey, or Margie, have run the Cabin for 20 years and are 2 of the loveliest people on the trail. They are both in their 80’s and expect to be closing at the end of this season, as they are starting to feel their age. Hikers will certainly miss them. The highlight of the stay is the dinner, which is served family style around a huge pine table, with Honey and Bear presiding at the top of the table, soaking up the stories and jokes of the hikers. The food is great and unlimited, with Bear pushing us all to eat more. It was a great evening for each of the 3 nights we stayed there, with friends old and new providing a changing cast of characters each night. Breakfast is similarly unlimited and I had 8 pancakes the next day, along with eggs, sausage and home fries. Bloody marvelous!! There was only room for 5 people in the cab of Bear’s truck the following morning, so I chose to sit in the open at the back of the truck. There were 4 garrulous women in the cab, plus Lighterknot so I preferred a quiet ride! The truck back fell open as we were going uphill, so I had to grab packs and poles to stop them falling out. The way the roads are configured limits the amount of miles we could do, so we had just another 10 Mike day that ended with a very tricky climb up near the end and a resulting perilous climb down Moody Mountain, with Bear meeting us at the end again. The third slackpack out of Bear and Honey’s was a more respectable 13 miles, with Bear telling us that we would likely finish at 5pm. The old boy knows his stuff, as I emerged at Maine 17 at exactly 4.59pm, giving me a stupendous view from the small parking area. That last evening at the Cabin, 2 of the Rocky Pizza Challenge participants, Hawkeye and Buchanan, showed up, the first time I had seen either of them since Tennessee. We had made arrangements to move on to Rangely and stay with Shane and Stacey,at the Farmhouse. This has been another terrific stay, and we were able to continue our food fest by sampling the local restaurants for 3 days. Shane has slack packed is for 2 days this far and we are now down to less than 200 miles from Katahdin. Indeed, we’ve now worked out our likely finish date of 9/29. One highlight of the past couple of days has been Saddleback Mtn, though it was clothed in clouds when we summited, so I took this video from its younger sibling, Saddleback Junior. We’ll be moving to Stratton tomorrow and all the hikers now around us are eager for the 100 mile wilderness then the finish. I told Diane of our expected finish date and she is looking for flights. It’s getting near and I hope you’ve been enjoying the journey with me. New Hampshire and Maine have been wonderful, while slackpacking has certainly saved my knees from too much punishment. However, we’ll be back to full packs shortly, so that should keep me interested till the end! The Lake of the Clouds Hut has a reputation of being one of the friendliest huts in New Hampshire and, despite a few reservations, we were treated well. We were able to stay in the hut overnight by doing “work for stay.” This variant of “work for scraps” involved more work, including endless washing up (by me, in a sink designed for a midget) and fridge cleaning (apparently long overdue) though we were fed very well and allowed to sleep in the dining room, in most cases on the floor. I was able to snag a bench and settled down for what proved to be a disturbed night. My reservations are more about the disregard us “hiker trash” have to put up with, though I may be being a little hyper-sensitive. That said, we rarely see a raising of the flag when we arrive bedraggled and wet!! We were dreading first light, as we knew the tenor of the day would be set by the weather conditions. The climb up Mt Washington was immediately in front of us and we set out when we saw breaks in the clouds and the sun trying to force its way through. This turned out to be a great decision. I’ve been hiking so much better in the Whites and I set off like a train, pushing on as the scenes revealed themselves in front of us. This video captures my excitement once more. We were expecting the weather to close in on us, as there had been snow the day before at the summit though, once there, after a quick team snap, we found the snack bar and topped up our sugar and calorie levels once we’d savored the experience at the top. Given the weather forecast and the unpredictability of Mt Washington, we moved on, heading for the next hut and, ultimately, the Osgood Tentsite. Trillium and Lighterknot were a little slower than me and Tee Bird and we all enjoyed the remarkably mild day and occasional break in the cloud that showed spectacular views. This is one from Mt Adams, followed by a daunting one of Mt Madison, our after lunch target. This was the next target, with its pinpoint summit. At the next hut, we lunched inside and braced ourselves for the steep climb up Mt Madison and the following, far longer, descent. Another exhilarating climb saw me at the top before the others and, as I was at the very small summit, I launched into a gorgeous, though precarious 360. We’ve settled into a kind of routine, breakfasting, packing up and leaving by 7.30am. Given the time it takes to do a mile in the Whites, particularly in the Presidential Range, we need to hike for about 10 or 11 hours to do pretty much the same number of miles. Our first target the following morning was Pinkham Notch, where we had arranged to meet Shepherd once more and refill our food bags. The terrain didn’t seem too bad, though I struggled quite a bit and was happy to get there, even though it was less than 5 miles. That said we got there in less than 3 hours and immediately hit the snack bar for a very substantial sandwich and various sweet goodies before consolidating our food bags. You may recall in a previous post that I had talked Stardust “off the ledge” when she was contemplating quitting and I was delighted to see her again, at Pinkham Notch, happy and hiking with a bunch of friends. It made me feel all paternal! I had been trying to make do with a single trekking pole after the previous day’s accident, but it really makes a difference when you are used to both, so I splashed out $100 to buy a decent, though not best, set of Leki poles. The effect was immediate and I really got stuck into the hike up from Pinkham Notch. It was a substantial climb up to, eventually, Wildcat Mountain, followed by a steep downhill mile to Carter Notch Hut. We offered to “work for stay” but, with only one guest, they didn’t need us to work but allowed us to sleep on the floor. There were eventually 7 of us crammed into the dining room, while I put 2 benches together and used them for my bed. That’s living!! After a fairly sleepless night on my bench, the following day turned out to be a great mileage day, yet one that was, once more, very painful on all our legs. We had to be packed up by 6.30am and out of the hut by 7, so it was an early start to the day. The climb up Carter Dome was the most intense of the day, with about 1500 ft elevation gain in just over a mile. However, we all seemed to be ok with this, despite some tough hand over hand stuff. We were rewarded with absolutely no view once we got to the top, as we found ourselves in the middle of a cloud. For the next couple of hours we were going along the ridge, sometimes up, sometimes down, before we came to North Carter Mtn and the truly ferocious descent on the north side. This was basically sheets of rock, wet from the overnight rain and ready to catch the least aware of us. I led the way, trying to find the least dangerous route down by a combination of rock hand and footholds, tree trunks, branches and even exposed roots, along with a heavy slice of luck. There were several times that I slipped, but was always able to recover sufficiently to steady myself and help the others. I found it exhilarating, though it was playing havoc with both my knees. We eventually made it to the Imp Shelter, at which time we had lunch and ran into a couple of hikers I hadn’t seen for several weeks, Nobo Hobo and Caddyshack. Over lunch, we decided to push on to the Rattle River Shelter, which meant a climb up and over Mt Moriah followed by another long downhill. Trillium and Lighterknot were struggling by the time we eventually got to the shelter and we decided we’d camp and treat the following day as a “nero,” with just a few miles into town and staying at a hostel. For me, this was a significant decision, as I pretty much put my September 25th finish beyond me. I’ve reasoned that hiking a little slower with a team is far safer than hiking a little faster by myself. This is disappointing, though probably sensible and I’ve squared the decision with both me and Diane. I want this to be a life-affirming trip as opposed to a life-threatening one. Another safe night and we were happily marching on the way out of the White Mountains with hardly a scratch. We have had incredible luck with the weather, only being rained upon when we were safely tucked up in huts. I couldn’t imagine how difficult these mountains would be if there was consistent rain and the rocks were always slick. As it was, despite a little bit of slickness on a couple of rocks, and roots, I’ve had a blast. I’ve been thinking about changes I’ve made to my diet, as I’ve gone from 4 high protein bars a day to 4 Snickers or Cliff bars, with a high protein bar at the end of the day once I’ve stopped hiking. Trillium suggested this as a better way forward following a conversation she had with a nutritionist and I certainly feel far more full of energy. That said, I started taking multi-vitamins at about the same time, so it may be that. However, as they say, “if it ain’t broke, don’t fix it,” so I’ll carry on as I’ve been doing and hope to get to the end as well as I feel now. We are currently neroing at the White Mountains Lodge and Hostel, near Gorham, an absolute bargain at just over $30, with laundry, working wifi and your own proper bed, as opposed to an exercise in scumminess at some other places I’ve been in. To keep the place clean, the rules are that no packs nor boots are allowed indoors and hikers get out of their filthy clothes and wear clean hostel clothes. As you can see, it’s quite a look. Marnie and Marnie’s mum (Molly) really make you feel at home and give two shuttles a day to stock up and fill your face, both of which we’ve been doing. It is only when you shower and generally clean up that you realize you are still part of the civilized world, a good indicator for anybody, I feel. We are nearly out of New Hampshire and now have less than 300 miles to go, though we are aware of the challenges that Maine poses. That said, I am hiking better than at any time on the trip and NH has far exceeded my expectations. I hate to make predictions but, injury aside, I’m going to complete this and, to be honest, I’m going to be proud of the effort when I’m standing there, grinning like an idiot at the top of Katahdin. This trip has tested me more than I can ever relate to you and I’m sure further lessons will be revealed once I can put the whole thing into perspective with the distance of time. I would urge anybody to do it as long as they understand that this is a full six month commitment to something they want to do more than anything else. Once you make that commitment, you’re almost there (apart from the 2200 miles, which still need to be hiked)!!! I’m afraid there are no pics nor videos in this post, as wifi doesn’t seem to be available in these parts of New Hampshire. I’ve recently been a little jaded about my hiking and have really been ready for the end. While that remains my goal, I have been absolutely knocked out by New Hampshire. Somebody further south said to me that the moment I step above the trees in New Hampshire will be the moment that I’ll realize why I’m hiking the AT. I’m always a little skeptical of such hyperbole, yet they were right. 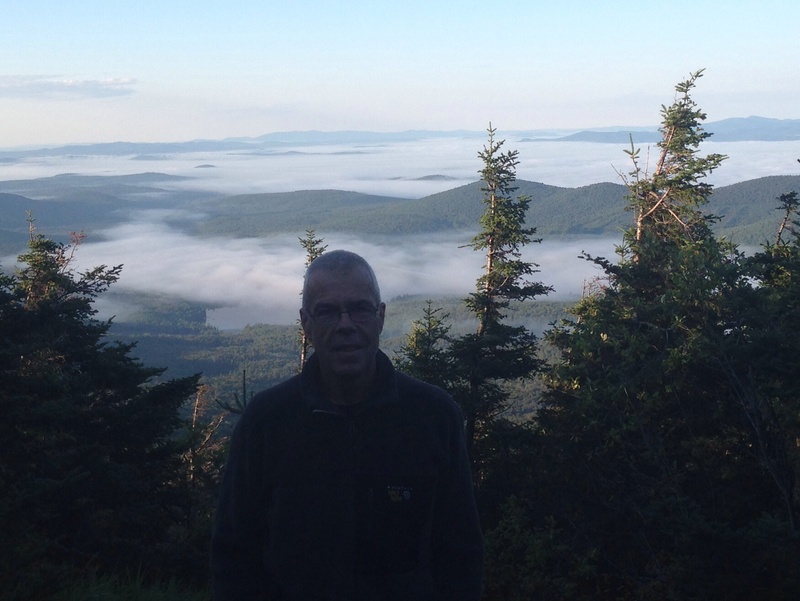 We had chosen to take the opportunity to slackpack over Mt Moosilauke in order to save our knees, particularly as the Hikers Welcome Hostel was a cheap and cheerful place to stay for a second night. It would be fair to say that we were all a little intimidated by the mountain’s reputation, yet we were carrying packs considerably lighter than usual and the difference when carrying such a depleted pack was so liberating. We had chosen to hike up the steeper side, from north to south, as the easier south side was likely to be gentler to walk down. As we walked, views started to unfold and we really appreciated our lighter packs. There were about 20 people at the top, many of whom I knew, and we all sat around in the sun having lunch for about 90 minutes. Walking down with Lighter Knot, I had my 30th fall on the way down, slipping on a root and, with my bear-scaring whistle in my back pocket, I really hurt my backside. During the day, I’d remarked to Lighter Knot that it would be great to be able to slackpack all the way to Maine and an idea started to form. I suggested that we could offer to pay somebody, say, $250 each to manage this and that, with a team of 4, it could prove to be an interesting proposition to an impecunious hiker. We recruited 2 women staying at the hostel that evening, Tee Bird and Trillium, while Trillium came up with Shepherd, a terrific young guy who already spends his time both hiking and helping hikers. Consequently, we were all able to shed some weight to leave in Shepherd’s truck. This wasn’t going to be a complete slackpack, as we couldn’t meet up again with Shepherd for a couple of days, so we needed a couple of days of food, along with most of the rest of our gear. My pack became a far more appealing proposition at 30lbs and, while it wasn’t as great as the day before, it was appreciably more comfortable than my everyday burden. This was certainly another eye-opening day, with a steady climb up South Kinsman Mtn leading to spectacular views all around. Trillium was struggling with her knees all day and Tee Bird hiked with her for most of the time, while Lighter Knot went ahead to meet up with some friends and I hiked alone. We finished an 11 mile day at Kinsman Pond Shelter and, to my dismay, the pond itself was the water source and, once I’d collected it, the water looked suspiciously like a urine specimen. Very unappetizing! Mind you, I filtered and cooked with it and everything tasted fine, though I’m guessing my standards may have slipped a touch lately. The 4 of us were able set up our tents together in a clearing and, New Hampshire being a pay-to-stay state, we had to hand over $8 each to the caretaker. It had been my best days hiking so far on the entire trip, with plenty of clambering hand over hand, a style that I became quickly comfortable with and one that greatly overcame my fear of the White Mountains. That record only lasted overnight, as the following day blasted aside everything that had gone before. Franconia Ridge links a number of consecutive peaks, including Mt Liberty and Mt Lincoln, yet it is something that I have never experienced in my life. As we climbed higher, we suddenly emerged above the tree line and the sight truly took my breath away. I knew It was coming up and I had seen pictures, though nothing prepared me for the sheer excitement that I felt. It was like being a kid again and I unashamedly giggled like one. It looked like a moonscape and I was an astronaut. In the vernacular of today, OMG. It was harsh, it was spectacular, with 360 degree views in abundance, and it simply overwhelmed me. On the top of Mt Lincoln, I got sufficient signal to FaceTime Diane, so much did I want to share the moment with her. On the way down, I was with Trillium, who was getting a little scared and, with the wind gusting so much that it was pushing us into the rocks, it was a tricky climb down. We were eventually able to reach our destination, a stealth camping site at Garfield Pond that also sourced water from the pond, though this time it was the right color. It was also the coldest night I’d experienced since the Smokies and cooking in the cold and the dark was not a happy moment for me. The cold night was something of a shock and it was still all cold weather clothing in the morning. We were aiming for another stealth camping site, just after Zealand Hut and first had to negotiate Mt Garfield. This was quite an uphill scramble, though my newfound confidence over the rocks was certainly helping and I could feel my hiking improving with each day. Once more, I spent quite a bit of the day behind Trillium, who continued to struggle with her knees, particularly after such a hard day the day before. Consequently, we had a fairly slow pace, though managed to achieve our goal. Lighter Knot was also suffering with his knees after the previous tough day. We got to one of the New Hampshire huts that hikers can, well, beg for food by asking for “work for scraps.” I got there first and the young lad in charge put me to work in scrubbing a filthy baking tin that looked like it had never seen soap before. I really tried but made a scant impression on the grime. He seemed quite happy and gave me cold oatmeal (I’d already had hot oatmeal) with raisins, followed by potato soup, both of which I dispatched with alacrity. I also bought a couple of chocolate chip cakes and woofed them down as well. We found another great stealth camping site, already with several fellow hikers set up and spent a far warmer evening cooling and relaxing. The next morning was the easiest day thus far in New Hampshire. It was pretty much downhill all the way and we were only going about 8 miles to meet up with Shepherd again. We were planning to find a motel to clean ourselves and our clothes up. Straight after we started, I reached into my pack and dropped my Ibuprofen all over the trail. Not wishing to kill any unsuspecting critters, I scrambled around on the trail to make sure each one was recovered. A spectacular trail magic was set up at the bottom and I enjoyed, among many things, 2 fried eggs. Marvelous!! We found Heike, a middle-aged German hiker we’d seen before and she came with us to find a motel. The three girls shared a room, while Lighter Knot and I had a room each. Shepherd was so patient, taking us down into the village for a late lunch, then taking us to a grocery to re-provision. Back at the Seven Dwarfs Motel, we set about washing our clothes in the sink, which was something of a new thing for me. I may have over-soaped everything, as it all seemed a bit slimy when I hung it all out to dry, though all was well with it in the morning. Today was looking to be a rough one, with a very steep climb onto the Presidential range accompanied by a lousy weather forecast. Once more, I was invigorated by the hiking, yet the clouds closed in near the top and all views disappeared. In the end, we were slogging along, in about 30ft visibility and made the Lake of the Clouds Hut by 3.50pm for another satisfactory 11 mile day, albeit I broke one of my trekking poles in my 33rd fall, damnit!!. The spring has returned to my step and I’m hiking better than ever, though I now expect to finish a few days later than I had hoped. I feel more secure hiking in a group and am looking forward to a few more slackpacking days in the coming days. Brian and Dee’s son, Stewart, kindly drove me back to Starbucks, where he had picked me up on the Wednesday evening. It had been great to take a zero and I was very grateful to Brian and Dee for their hospitality. Of course, at Starbucks, I couldn’t resist the chance of a triple grande non fat latte (old habits die hard – I should have had full fat) and a Blueberry scone, so I dallied for 30 minutes before hitting the trail once more. It was spitting with intermittent rain as I started, though I’d been warned by the forecast. Happily, what rain there was eased off and my first impression of hiking in the woods of New Hampshire was that it was all fairly benign. Something of an uphill to begin with but nothing too terrifying. I knew that this was an entirely false impression but enjoyed deluding myself nonetheless. Until you have to face it, convince yourself it’ll be ok! I ran into a couple of familiar faces that morning, starting with Voodoo, the witness of my most embarrassing moment on the trail (so bad, that I couldn’t write about it and simply described it in a video), and Lighter Knot, an older guy I’d camped with in CT. Lighter Knot and I talked about possibly teaming up for some of the tougher climbs to come. We said we’d meet later at Moose Mountain Shelter and decide where to end the day at that time. As luck would have it, by the time we got to the shelter the rain was just starting to take hold, so our day was over after only 11 miles by 3.05pm. A Japanese guy who Lighter Knot knew, Loon, joined us later and we were all settled in the shelter by 7.30. I don’t normally sleep in shelters, though I make an exception when it rains. While the rain itself subsided, the wind through the night blew water from the trees on to the shelter, drowning out any mouse or chipmunk activity, which was fine by me. They may have been marching round and poking into our packs, but as long as I can’t hear them, I’m food to go. I had probably my best night in a shelter and woke refreshed and ready to move on. I was out by 7.50, making excellent progress for the first 5 miles. The real mountains were still to come, yet I really struggled for the rest of the day to make another 7 miles. They tended to be pretty much straight up, with no side-to-side and I took extensive breaks, gasping to regain my breath and the power in my legs. That said, there hasn’t been a mountain I’ve failed to get over, so I take heart from that. 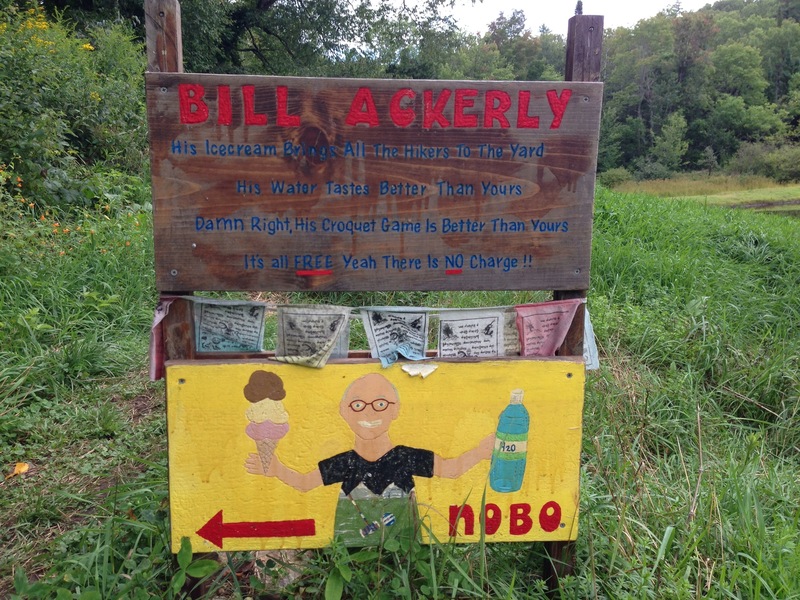 Lighter Knot and I stopped at the kindly Bill Ackerly’s home (just look at the cute sign that he made) at the promise of free ice cream and water top up. Bill is a real gent, 86 years old and delighted to have hikers cluttering up his porch. He claimed that it was his 86th birthday, though one of the hikers who had been there the previous evening said that he had said the same thing the day before! He was a treat to meet. I got to the shelter, which was a very dreary, closed building and waited for LK before we settled on the tenting site, a few hundred yards before, with a beautiful view. I had my best sleep in a tent in a long while and breakfasted with a glorious view in front. Lighter Knot left 10 minutes before me and called at the shelter, where he hoped to, and did, find Loon. We had arranged to meet at the tentsite at Ore Hill, about 12.5 miles away, so I tried to make some early progress down the hill. It was wet, rocky and very muddy. Indeed, I fell for the 27th, 28th and 29th time, each time slipping on the mud and all the falls occurred within an hour. I didn’t hurt myself on any of the falls, but they still always slow me down and tend to make me more tentative, though clearly not tentative enough, as I continued my fall fest. I ran into several SOBO’s, many of whom were eager to share their stories of the White Mountains and Maine. It all sounds like a bit of a horror story to me and I feel for the first time that I may miss my September 25th target date. My lovely wife always tells me that she would rather I missed her birthday and stayed safe, so I’m going to concentrate on the safety while still keeping an eye on the miles per day. You never know, I may still make it. There were two good climbs today, though nothing I haven’t experienced before, and I got to camp at about 4pm, while Lighter Knot showed up about 30 minutes later and Loon rolled in at about 6.30pm, though he probably left about 2 hours after us. I must say, knowing that I won’t be camping alone is quite a pleasant feeling, so I may have found the partners I was previously avoiding. With my new amigos, Lighter Knot and Loon, around me, I slept really well again, waking after 6.20am and refreshed once more. We had decided to hike just to Glencliff, only about 8 miles away, for a couple of reasons. First, I had a food pick up from the Glencliff Post Office. Second, Mt Moosilauke is the beginning of the White Mountains and LK and I wanted to slack pack our first mountain in that range. We’ll be doing that tomorrow morning. Slack packing involves a small day pack, with the hostel taking hikers to a specified point ahead on the trail, then hiking back to the hostel. In this way, we’ll be hiking Moosilauke from north to south which, from the profile, looks to be an easier route. There are a varying number of attitudes to this type of hiking, some believing that it isn’t somehow “correct.” My attitude is that you take what you need for each day and, when you are returning to sleep at the same place, you only need a small pack, with water and some food with, perhaps, an article of clothing. This is where “hike your own hike” prevails, so I’m happy with our decision. While the three of us hiked separately today, the three of us got to the end of our morning effort at the same time and headed east. We reached the Hikers Welcome Hostel within half a mile. It was a little like Standing Bear Farm, which was more than 1000 miles back, where nothing looked right but it all worked. A shower, laundry, tent site and shopping trip allowed us all to hang out for the afternoon, chatting with SOBOs and even one guy who is boomeranging. 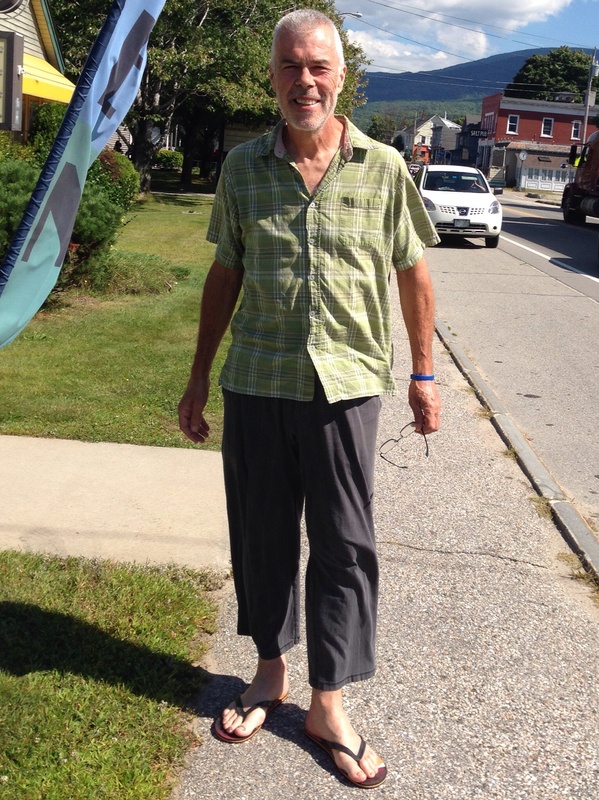 Incredibly, he started on Springer on the same date as I did and has been to Katahdin and is heading back down south! Nearly 4400 miles in one year! Extraordinary. I’m looking forward to Moosilauke in the morning and, with a great forecast for the next 5 days, we look set fair for the Whites. This is a bit of an experiment, as I’m trying to post using my iPhone instead of my iPad. If it works out, the iPad goes home and I save about 1.5 lbs in my pack. Every little bit helps! After staying overnight at the excellent Inn at Long Trail, I had to hike for 0.5 mile to get back to the AT. I knew that I’d be crossing the 1700 mile barrier within a mile or so, though physical markers had been missing for the past 400 miles. Of course, this time, there were 2 markers, about 200 yards apart and I snapped pics of them both for Facebook. how the beauty of everything is magnified by sunshine; it’s like nature’s own Windex, washing everything to a sparkle. Leaving the pond and starting to climb, I ran into a young guy, Dude, having a cigarette on the trail. He started June 9th (yes, that is 78 days after me!) and is averaging over 25 miles a day! You’d be surprised by the number of smokers (both fragrant and non-fragrant) on the trail; it is an oddity that surprises me every time I see somebody light up. We were spared a boggy walk soon after by a magnificent, clearly fairly new, wooden path through fields. These can be of dramatically varying degrees of disrepair, but this was almost pristine and very welcome. Shortly after, I ran into Stardust, a young woman I’d met a few days before, crying on the trail. She sobbed that she is homesick and wants to go home, having lost her group and is scared to hike and camp alone. She thought she may have contracted Lyme Disease and had gone into Rutland to check. That had proven to be negative and now she was scared and alone. I really felt for her and tried to help her think rationally about it. I talked to her about heading back to the Inn at Long Trail and waiting for another group of friends to catch up, while she asked me which shelter I was heading for that day. I told her, yet she was still undecided on what to do as I left. I doubted if I’d see her again. Towards the end of this excellent hiking day, during which I covered 18 miles, I stopped to get some water from a stream and couldn’t find my filter. Panic quickly set in, as the water looked a little doubtful and I searched my entire pack before finding the filter precisely where it was supposed to be! Everything has to be in its place and, when something seems to be missing, my reaction is immediate and negative. I reached Wintturi Shelter and met a section hiker, Papa, who started hiking the trail in sections on his retirement at 60. He was very chatty and eager to ask about doing the whole thing at once. There was another thru-hiker who’s name I can’t recall, and we were all chatting amiably when Stardust turned up, grinning, about 15 minutes later. She was clearly much happier and thanked me for “talking me off the ledge.” We were all happy for her continued adventure. I slept far better than I had of late and woke to my 5.35am alarm, yet I was still last out of camp, as usual. I had a chatty breakfast with Papa and we were joined at the shelter for breakfast by Giblets, a section hiker I had met the previous evening, camping about 3 miles before the shelter. He’s a vegan and he showed me his breakfast, a combination of hydrated dried pineapple and bananas from Trader Joes. Over 1100 calories!! He and I left the shelter together and saw each other several times through the day; indeed, he even managed to catch up with me as I was filming another beautiful panorama. There were some great breaks when the trail passed through such meadows, though I was pretty much unaware of how far I’d gone, so different did the terrain seem compared to my guide. I stopped at a farm shop, which was just 0.2 miles off the trail, where I ran into three SOBOs and Giblets. I had a blueberry and pecan pie with ice cream after a breakfast burrito. I also bought some cheese for later. My hunger is constant and never fully satisfied. In speaking with others, it seems this lasts for about a month after the hike, so I expect to be a fat bloke again by my birthday at the end of October. Soon after lunch, struggling up another hill, I ran into two familiar faces, Songbird and Bypass. I had last seen them about 1000 miles ago and here they were, coming towards me. They had flip-flopped, which means they had reached halfway, then gone to Katahdin and hiked south. They assured me that, while they were tough, Maine and New Hampshire were eminently “doable” and glorious to hike. It was great to see them again and reassuring to hear their assessment of my finishing states. Soon after meeting the two of them, I left the woods onto yet another meadow and, even though I’m now not sure that this is actually Thistle Hill, it is still gorgeous. I got to the Thistle Hill Shelter, after a less than 12 mile day, to meet more SOBOs, Spot, Chin Up and Pickles. We were later joined by Giblets, Sonic and Froggy Fellow, with his dog, Rocket Dog. Everybody enjoyed a friendly evening and Giblets, who seemed to cater like a Puerto Rican (carrying more food than he could ever eat), gave me a meal of black beans and rice, as well as his breakfast combo of bananas and pineapple, which I gratefully accepted and hydrated overnight. It was a gorgeous following morning, as the sun slowly, and blazingly, lit up the east facing shelter. As usual, I was awake and out of my tent first, while the others gradually came to. Astoundingly, once we were all awake, we noticed that Giblets was still snoring in the shelter, with everybody, laughing, talking, cooking and packing around him. Indeed, he only woke just as I was about to leave, this time second from last. Without going into too much technical detail, my hydrated fruit breakfast decided that it wanted no further part of me after about an hour and I quickly lost 1100 calories in the bushes. Enough said!! I got to West Hartford, a tiny Hamlet directly on the trail, and was crossing the bridge, when a woman pulled up in her car, pointed out her house across the bridge and told me I could get coffee there. Never one to refuse, I walked up to the house, to be greeted by a jolly guy called Randy. He and his wife, Linda (the lady in the car), welcome hikers to their home for coffee and breakfast if they’d like. Of course I would!! I stayed for about an hour, while Randy told me that his village had been hit devastatingly by Hurricane Irene a couple of years ago when the river burst it’s banks and Randy’s house was under 5 ft of water. 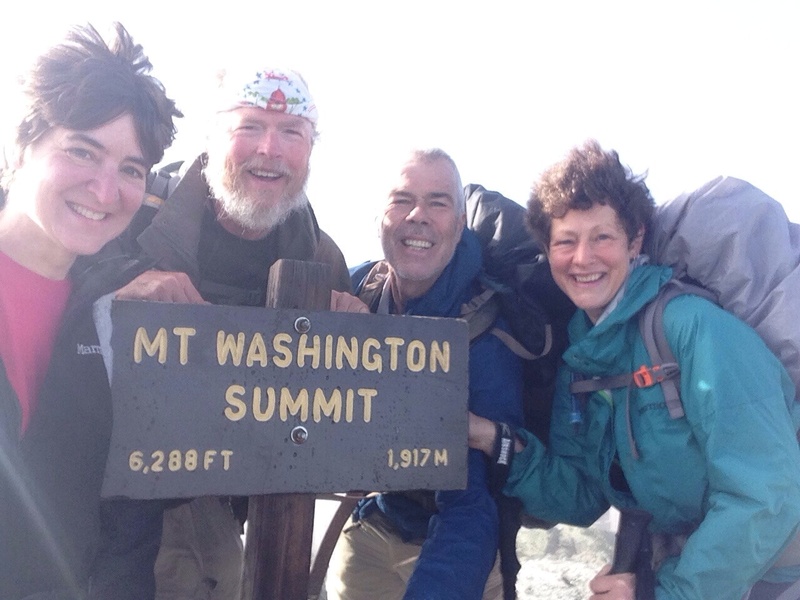 It was a dramatic story, imbued with hope by Randy and Linda’s kindness to hikers. 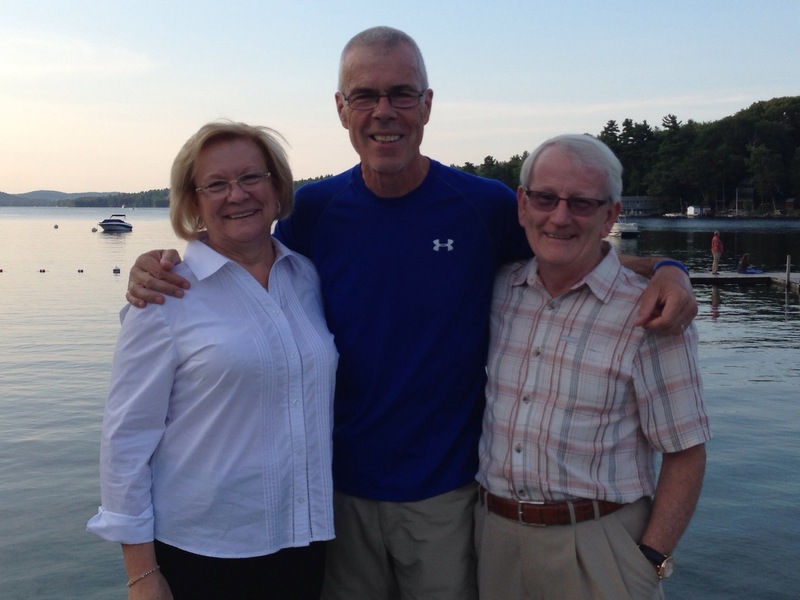 I now had to pick up my pace in order to get to Hanover, NH in order to meet the son of my friends, Brian and Dee Scott. Stewart had kindly agreed to meet me there and take me to their house. While still undulating, the terrain proved to be reasonable and I got to the appointed place in good time, even finding more trail magic of a cold coke on the way. There was one spot at which the trail closed in on me quite dramatically, so I took the chance to film it. I have now moved into the second from last state and know that the challenge only increases from here, so it was great to be able to chill out for a zero day today with close friends while preparing for my resumption tomorrow. It has been a blessing to spend the day not walking and I’m raring to go again. Thanks, Brian and Dee. All my bags are packed, I’m ready to go…..